The thing with having a big family is it can be difficult to find somewhere to eat out which suits all tastes. I mean, I like fast food but sometimes it's nice to go somewhere where you get to use a knife and fork. It's half term here and we were meant to be going to stay with a friend in Wales but for a number of reasons we were unable to go so I wanted to make it up to the children with a treat. 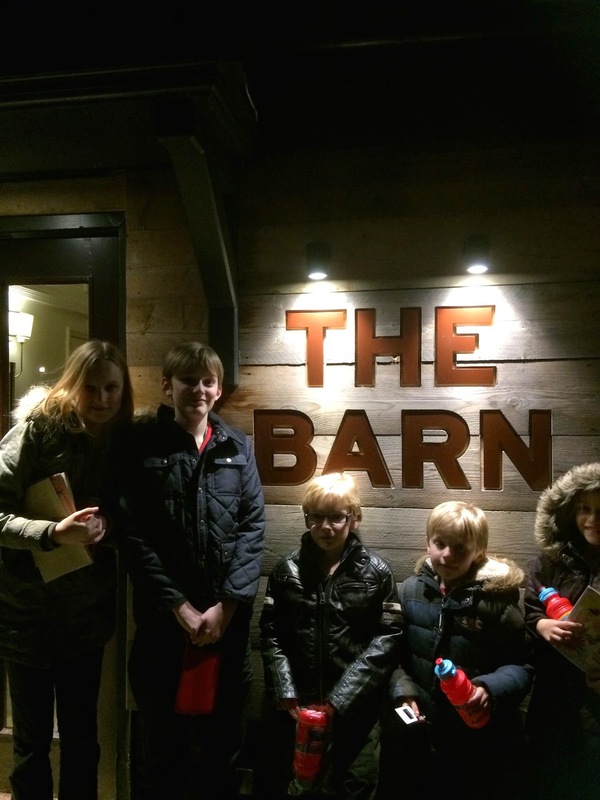 I told them to get dressed up in slightly smarter clothes than their favourite onesies and we headed off to The Barn, a Beefeater Grill restaurant in Milton Keynes. A scroll through their Mr Men kid's menu online had convinced me that even my fussiest child would find something nice to eat there! It's a good job there's lots of choice because when I told Grumpy we were going to the Beefeater he exclaimed:"I don't want to go - I don't like beef." This is true although he will eat it if it's in burger form or we call it chicken. Shh! Don't tell him! 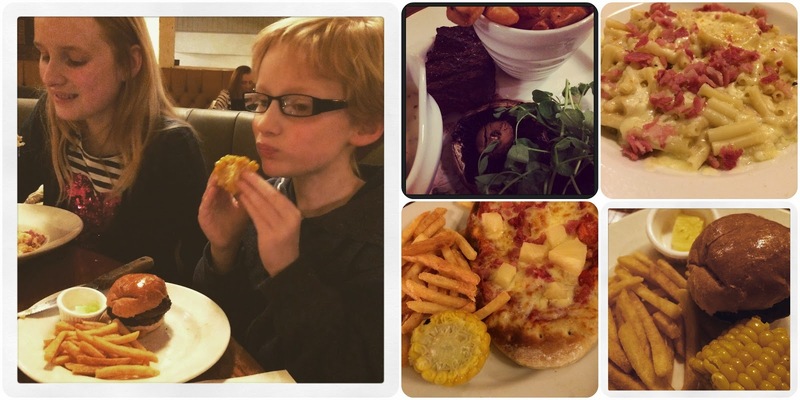 We had tried to book online but it seemed eating at the Beefeater Grill over Valentine's weekend had proved incredibly popular so I was unable to reserve a table for two adults and five children aged 6-15 using the website. However when I rang the restaurant the manager offered us a table for 7pm on Sunday night which was fine as the children had no school the morning after. The restaurant was easy to find using the address details from the website and we were seated within five minutes of arriving. It's a large restaurant but on lots of levels with step access* (poor waitresses!) and we had a circular booth right in the middle giving us lots of opportunity to people watch. Well, I say us. The children were far too busy with their free 16-page activity packs to watch people. Even Grumpy who had insisted on taking his tablet computer forgot all about Angry Subway Candy or whatever it is he plays and got on with word searches, monster making, a spot the difference challenge and a host of other diversions. The mini packet of crayons each child received were well used and they loved the 3D glasses and poster which made the pack a little bit different to the normal basic colouring pack many restaurants offer. 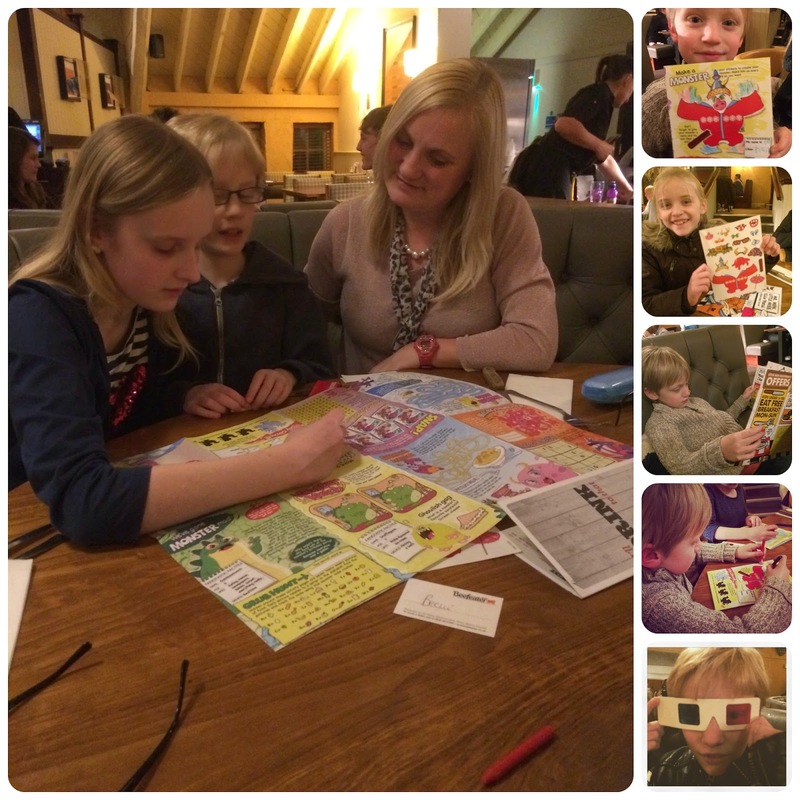 We persuaded them to take a minute away from the activity pack to look at their special Mr Men kid's menu which was comprehensive with a good selection of kid's favourites (although carefully "healthied up" it seemed) along with a few extras. They could even order a proper steak but predictably mine went for steak burgers (x2) and a pizza. Let me explain the kid's menu. One course costs just £4.49 (including squash to drink), two courses is £5.49 and three courses costs just £5.99 with 20p from the 3-course menu going to Great Ormond Street children's charity. We liked that they could completely customise their meal - choosing their own side orders means there is much less likely to be leftovers. They could choose two items from chips, basmati rice, mash, garlic bread, peas, beans, mini corn cob or veggie sticks with sour cream dip. The teens, myself and DH were very quick with their choices. Three of us went for the 6oz flat iron steak (with flat mushrooms, grilled tomato and chips ) and DD#1 asked our lovely waitress Becki if there was any chance she could have the mac and cheese with bacon which was advertised as a side order. No problem - a double order of the side was added to our large list and we settled down to wait feeling very hungry with the lovely smell coming from the kitchen. Our food did not take long to come and looked (and tasted) delicious. My youngest daughter pointed out they had mixed up the side orders for her and Grumpy but Becki sorted the mix-up so swiftly and cheerfully with a nice apology that it didn't spoil the evening. A big thumbs up for excellent customer service from this fabulous waitress. I had ordered a Tarragon Bearnaise sauce and DH added a Classic Steak Jus to his order (£1.49 per sauce) and I have to say they were both excellent and lifted a very tasty steak n chips meal into something worthy of a really good restaurant. Both sauces came in generous portions served in little jugs so you could add to taste. We had opted for refillable drinks and unlike some occasions I have ordered this we were repeatedly offered refills which arrived shortly after we had asked for them. Another pleasant surprise was the bottomless chips. I didn't spot this on the menu but when waitress Becki noticed we had nearly finished our chips she offered more and explained that chip refills were free! We even had a choice of chunky, skinny or spicy fries. Pudding time! Because of the refillable chips I was pretty full but the children of course have extra dessert tummies so they were very keen to look again at their menu. The older children were allowed to choose a pud from the children's menu so three of them chose the Mini chocolate challenge with ice-cream, chocolate sauce, marshmallows and chocolate brownies while the other two chose jelly and ice-cream whilst asking if they could be served separately instead of the ice-cream topping the jelly as shown on the menu. No problem! 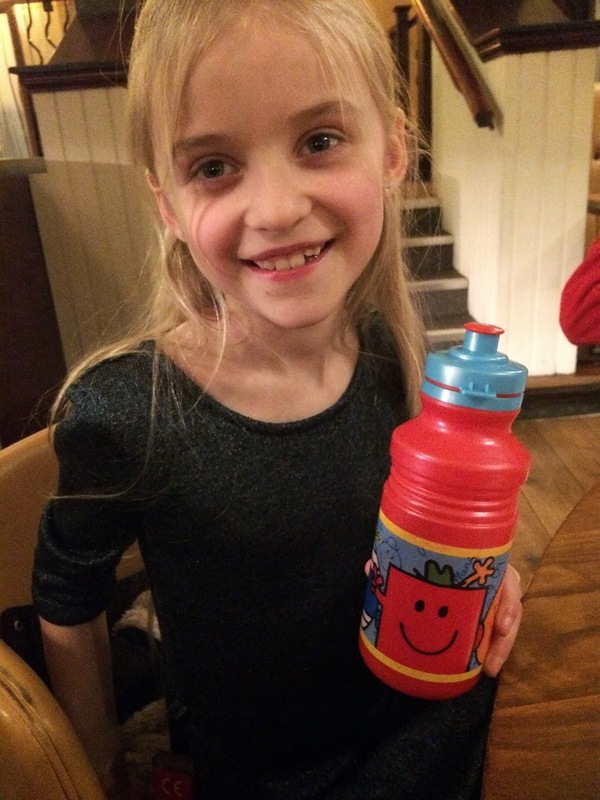 At the end of the meal Becki presented the children with Mr Men water bottles which apparently you get free if you order two courses or more from the kid's menu. At the end of a lovely evening which thanks to the waitress, the activity packs and the lovely food was very relaxing the total bill came to £73.46. Not bad for 7 people and a lovely way to spend time together as a family in half term. Nice large restaurant which because of layout didn't feel overcrowded even when busy. Acoustics great so I could hear everyone on our large table but didn't feel overwhelmed with background noise despite all the diners. Food portions generous and quality good. Waitress excellent with the right level of attentiveness and quick to sort problems out cheerfully. Customisable menu - great for people with food intolerances or fussy eaters. Initial contact on phone was off-putting. The person I spoke to trying to book was curt and initially unhelpful. I had to be persistent to successfully book. *Step access. Online it states that the restaurant is wheelchair accessible but doesn't suggest you should state when booking if step free access is required which given the design of this particular venue I think it probably should. Toilets- the floor of the gents was swimming in some unknown liquid with soggy toilet roll everywhere. We reported it but a check-back an hour later showed nothing had been done about our complaint. The ladies had piles of toilet paper all over the floor in each of the cubicles with none to use from the dispenser. Allowing for the fact that this might have been a mischievous toddler in the previous five mins again I reported it - check back an hour later showed paper had been (mostly) cleared and dispensers refilled. Disabled toilet was clean but drop-down baby change wall device had notice stating it was out of order. 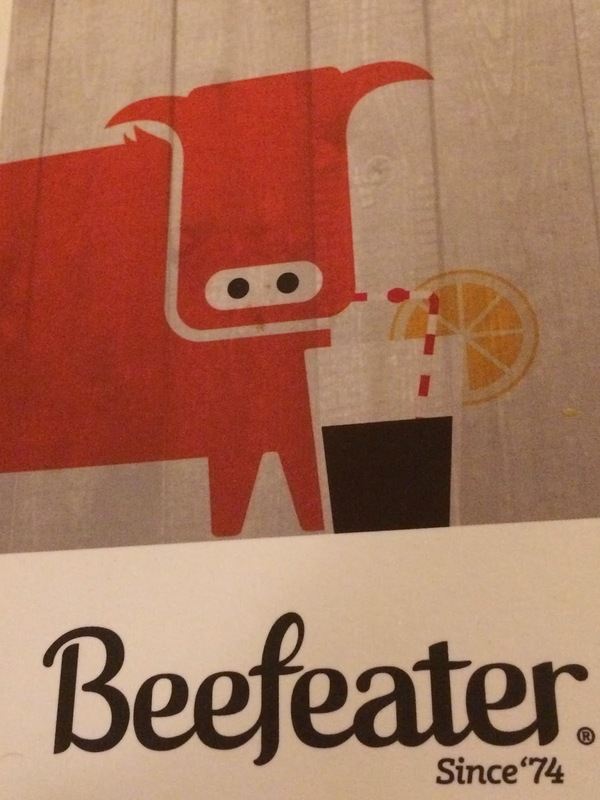 On the whole I think you can't go wrong with a Beefeater Grill Restaurant. It suits all ages and all tastes. You can check prices, menus and availably online on an excellent website which also features a cute Little Miss Hug video for children to enjoy. You can also find details of money-saving offers like the kids eat free on Saturday (12-5pm) deal, daytime and evening value menus and the £4.99 meal deal on offer Monday to Saturday before 6.30pm. Disclaimer: I was given £50 worth of vouchers for the purpose of reviewing The Barn Beefeater Grill. Views and opinions remain honest and my own. It looks like overall it's a fab place to go and spend an evening with the family. I love how customisable the menu is, I know as well as you when you got more than 4 kids it can get really difficult to find something that you all agree on. It's fab that she kept letting you know all the little bits and bobs that you didn't know about whilst you were there like the chip refills and the free water bottles. Popping over from Magic Moments. Strolled in here on a busy Saturday night and was very happy with the dinner. This is now one of my favorite restaurants in the city. Portions at San Francisco restaurants are good and reasonable for the price offered. Definitely worth a try.